Ever since I told my son about my idea for Smartwatch.FM, he's been fixated on getting a smartwatch for himself. I wasn't surprised since he's technical, loves gadgets and has always liked watches, and so almost immediately after I told him about what a smartwatch does he'd started asking me how he could earn money to buy one. Well, after saving up long and hard, he'd finally earned enough for a smartwatch. He'd decided on a Pebble watch, in part because he's started to program software, and he liked the idea of making his own watch faces and maybe even apps. Another reason was it was also fairly low cost at $150 and also readily available from Best Buy. So last night we headed over to the electronics super store and walked in. It was pretty empty, so I walked up to a circle of guys in blue shirts standing around and asked them where the Pebble watches were. "They're over here,' said what looked like the manager, motioning for me to follow him. "They're on exclusive with us." He walked us over to the aisle and we saw that there was only the display watches with no boxes. He called to the back where they stocked their inventory and found out that they while they were out of red Pebbles, they had plenty of black Pebbles. "The reds sell out almost instantly," he said. "Ever since the first day." I asked him why he thought that was so. "Well, I think they made less of them. But they're also just really popular." My son had wanted a red pebble, but most of all he just wanted a Pebble, so he decided he was ok with getting a black one. 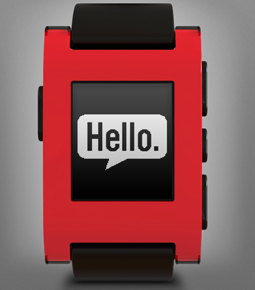 As we walked out, a the door checker asked if we got the Pebble for my son (who was excitedly holding the box). He nodded knowingly. "You'll have some fun.